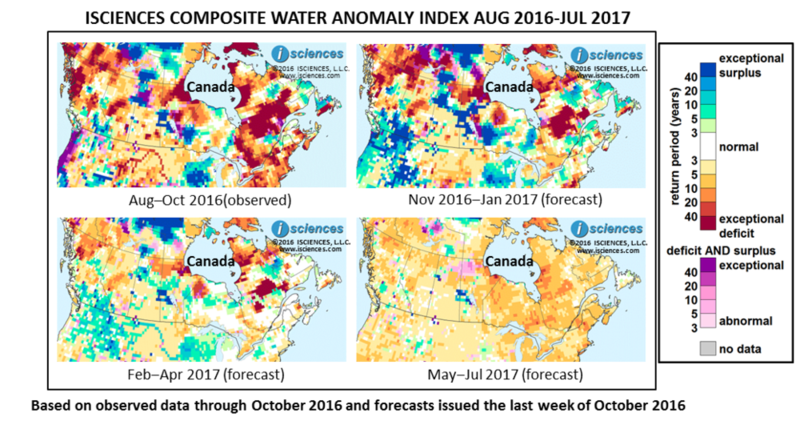 The outlook for Canada through July 2017 (below) indicates exceptional water deficits (greater than 40 years) across the center of Quebec, southern Newfoundland, northeastern Manitoba, and along the eastern shore of Hudson Bay. Deficits of varying severity are forecast for northern British Columbia, central Alberta, central and northern Quebec, along the border of Ontario and Quebec, and southern Nova Scotia. Surpluses are forecast for Ontario’s southwestern corner, the central shared border region of Saskatchewan and Manitoba, northwestern Saskatchewan, and southern British Columbia. A report by University of Waterloo’s Intact Centre on Climate Adaptation claimed that Canada is not properly prepared to protect its infrastructure from climate change. In British Columbia, water is pumped out of Cowichan Lake to Cowichan River to preserve industry and salmon runs during a period of drought; however, this may be a temporary solution as the lake level has also been falling during the drought. Overall, the November through January forecast indicates that the extent of exceptional deficits will shrink. This attrition is noticeable in: the center of Quebec, though a vast expanse will remain surrounding Lake Mistassini; southern Nova Scotia; and southern Newfoundland. Mostly moderate (5 to 10 years) deficits are forecast to persist in Southern Ontario beginning near London and tracing a path northward along the corridor formed by the shared borders of Ontario and Quebec. Exceptional surpluses are forecast for a large area in the southwestern corner of Northern Ontario from Kenora north to Sandy Lake, with surpluses of lesser severity emerging eastward. Also in Ontario, extreme (20 to 40 years) surpluses are forecast to emerge from the southern tip of James Bay southwest to Lake Superior. Exceptional surpluses will emerge in the Columbia River Basin in southern British Columbia; surrounding Churchill Lake in northwestern Saskatchewan; and, a vast arc in Manitoba from Hudson Bay – curving west then south – to Lake Winnipeg. The forecast for February through April indicates a transition to normal conditions, shown in white, for many parts of Ontario, Quebec, Labrador and Newfoundland, New Brunswick, and Nova Scotia. However, exceptional deficits will continue to emerge in the center of Quebec. Exceptional surpluses will persist west of Lake Winnipeg in Manitoba, and moderate surpluses to isolated instances of exceptional surpluses will persist in southern British Columbia. After May the forecast indicates the emergence of primarily moderate deficits throughout the country, with greatest extent and severity in the eastern half.